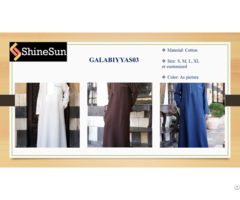 Welcome to our company-Shinesun industrial Co., ltd .
With many years of experience, we special line in Muslim clothing for men and women.We make effort change models for every year that suitable for your styles. We want to introduce one of our products-Top for men.As you know, we care about quality, feature and trend that reason why our product can make you feel comfortable and fashionable.Besides our product has various color so you can choose what you like, on the other hand, you also can request with us the color you want. About the price, don’t worry, Our price wont exceed your pocket.So please contact us to get one. -Feature:Eco-friendly, Comfortable, thin and soft.. Your choice is our pleasure!